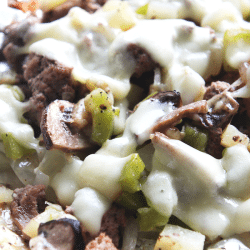 Philly Cheesesteak Tin Foil Dinners – Beef, green peppers, onions, mushrooms, provolone, salt, and pepper, wrapped up in an easily made tin foil packet. Welcome to another Man Monday. Sarah has been on a Philly Cheesesteak kick lately. She can’t get enough of them. Which is fine with me because I love the things. Interestingly enough, these Philly Cheesesteak Tin Foil Dinners actually happened by accident. So there I was, with the two ladies in my life and my hound dog in the middle of the Colorado Rocky Mountains. We had just set up our camp, a good 100 feet from the dirt-road and no other campsite in sight. I’m setting up our camp – building a fire, setting up the tent, getting dinner ready (just regular old foil dinners), when suddenly I hear a generator being started up in some hidden camp not 50 yards away in the trees. How dare they?! This is the freakin’ wilderness! Why do you need a generator? To power your iPhone so you can keep playing Candy Crush? I hope a mountain lion eats you – then vomits you back out… because you’re gross. Geez. Anyway. So there I was. Making foil dinners. I’m looking around and notice something very interesting. I had beef, provolone, peppers, onions, and mushrooms – I had a philly cheesteeak on my hands! Of course, I had all the other stuff like potatoes and carrots, but why not just try this Philly foil dinner? Well the rest is history folks. 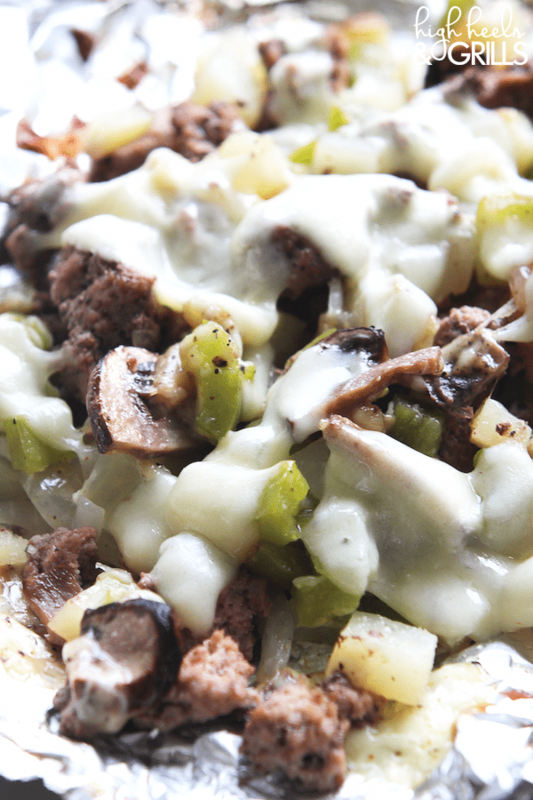 We GREATLY appreciated these Philly Cheesesteak Tin Foil Dinners. So easy – Divide all the ingredients into fourths. Place a nice 1/4 lb layer of meat on a 14" x 14" square foil piece. You can do a solid patty of meat (the manly option), or disperse the meat into chunks (for women - or those with dentures). Be very generous with the salt when seasoning your uncooked pocket of awesome. Put more than you think you will need. Somehow, the salt kinda disappears during the cooking process, so be liberal. 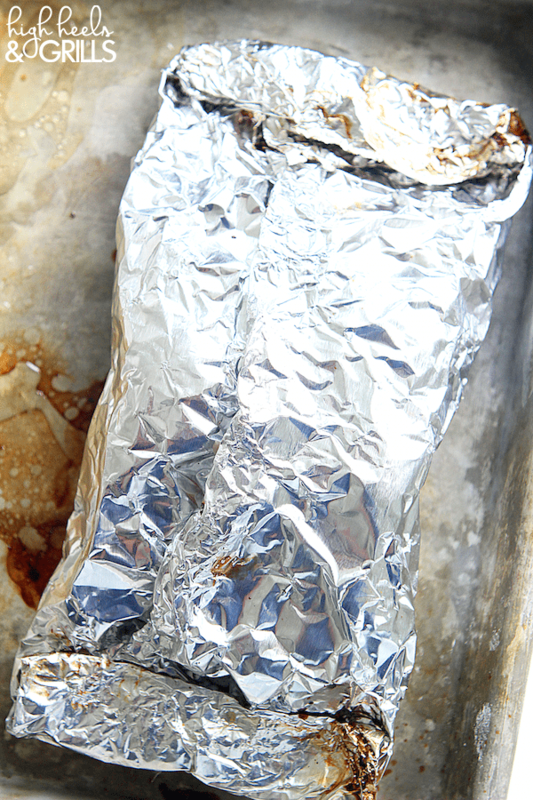 When the foil dinner is built according to your desires, wrap it up in the foil. Bring two sides in and crease the sides together, folding over a few times to make a tight pocket. Take the open sides and fold them closed until your fold runs into the food piled inside. Place the packet on a cookie sheet and bake for about 20-25 minutes - no need to flip or double wrap. If you want to do this over a fire instead, place your dinner very close to (or even directly on) a pile of hot coals/briquettes. Cook for approximately 10 minutes, flipping halfway through. I am a big fan of foil wrapped meals and this sounds delicious! I will be trying it, but not on any camping trip!! Do you precook the Ground beef or use raw meat in the foil? We use raw meat. 🙂 It cooks in the oven and the juices from it add a great flavor to the veggies! Really good! Will be making this one again! I’m so glad you liked it!! We love it when we want something different than traditional tin foil dinners. It helps that it is so easy to make! For non red meat eaters what kind of chicken can replace the beef? Made these for the family on our last camping trip. Super yummy and different from the normal foil dinners. We loved it. I did add Italian seasoning to them for extra flavor. Definitely on our make again list. Thanks for the delicious idea.